At the end of this post, find your chance to win a free iPad! Apple has always catered to the designer crowd. While you might not be creating or tweaking new designs on an iPhone or an iPod Touch, the iPad brings something different to the table. Whether it's brainstorming a new idea or showing a client some of your work, the iPad will bring the ability to design effectively on the fly. Think of it like a hi-tech version of a writer's Moleskine. With that in mind, Website Magazine looked into iPad apps for Web designers. Below are a few from which every designer can benefit. Because it's free, you can guess that Adobe Ideas has limited features. But that doesn't make it worthless. 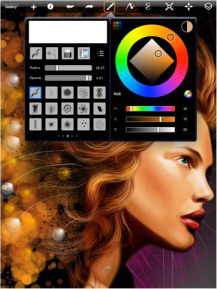 It features simple vector-based drawing tools, and the ability to e-mail sketches as PDFs - that can later be edited in Adobe Illustrator and Photoshop. Adobe Ideas is appropriately named - it's a free, easy-to-use app to quickly generate that next great design while you sit in your favorite coffee shop, or in a conference room with a client. Autodesk has been in the game for a while now, so it's no surprise they were one of the first to release a full-blown design suite for the iPad. The app contains a full set of sketch and painting tools, as well as some new additions that were not found in the iPhone app - including shape tools, more brushes and "a set of triple-finger tap/swipe gestures for Undo/Redo, Layer Editor access, Brush Editor access, and Draw Style (i.e. pen size/opacity) access," according to one reviewer from the iTunes store. Other reviewers are just as happy, with several stating that this app was worth the price of the iPad itself. The app also facilitates the ability to export and share files, creating a much improved workflow. Every designer should have a good photo editing app and this one fits the bill. Crop and rotate photos, add speech bubbles and text, alter colors and draw basic objects. Edited photos can be uploaded directly to Facebook or Twitter, or e-mailed. What would really make this an invaluable on-the-go app would be a camera on the iPad. No such luck yet. Head to YouTube for a nice video demo of Photogene for the iPad. The most expensive one of the bunch, OmniGraffle is designed to offer productivity to the professional Web designer and developer. With this app, you can freehand sketch designs and choose from basic stencils to get started with a design. The app allows for the creation of professional-looking flowcharts and mind maps complete with text that can be altered to fit shapes and full color palettes for full customization. OmniGraffle is a nice app to make website wireframes on the fly. Documents can be shared and saved as scalable PDFs. OmniGraffle offers plenty of potential for high-scale work, at a high price. Some early reviews indicate the app is a little buggy, so it might be worth waiting for an update. What good is working on the go if you can't make your work go where you want, when you want? With FTP On the Go PRO, you can browse, upload and download files from your FTP server, download and edit text files and re-upload changes. Because of the iPad's larger screen size, many files are able to be viewed and edited at once. A built-in Web browser lets you see those changes without leaving the app, which is important in a non-multi-tasking environment. Another nice feature, particularly for design teams, is the ability to wirelessly share access to stored files. You can connect from a computer, or even an iPhone, using a Web browser or any FTP client. Again, a camera would come in handy here. Enter to win an iPad: See Below!